FILE - Group picture taken at the UN building in Vienna after Iran and six major world powers reached a nuclear deal. Iranian diplomats say they expect President Donald Trump to abandon the international deal restricting Tehran's nuclear activities. They are intensifying their lobbying of European governments, especially the signatories to the agreement, France, Britain and Germany, hoping they can dissuade the U.S. administration from repudiating the agreement. FILE - Iranian Foreign Minister Mohammad Javad Zarif speaks at a joint press conference with his French counterpart, in Tehran, Jan. 31, 2017. 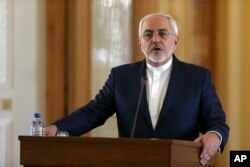 Zarif refused to confirm that the country conducted a missile test. The U.S. State Department is due to certify to Congress in two weeks time whether Iran has been complying with the terms of the deal, formally known as the Joint Comprehensive Plan of Action, or JCPOA. Trump has said he has made up his mind already, but hasn't told European leaders his decision, including Britain’s Theresa May, who asked him reportedly at a bilateral meeting at the UN last month. 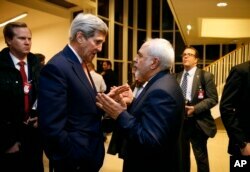 FILE - In this Jan. 16, 2016, photo, Secretary of State John Kerry talks with Iranian Foreign Minister Mohammad Javad Zarif in Vienna, after the International Atomic Energy Agency verified that Iran has met all conditions under the nuclear deal. And there has been a quid pro quo hint from the Europeans that they will be more forward-leaning and cooperative with U.S. efforts to contain Iran on other fronts. “European foreign ministers tell me that they would join us in confronting other Iranian misdeeds,” if the Trump administration doesn't abandon the deal, John Kerry, the former U.S. Secretary of State wrote in an opinion article for the Washington Post published Friday.